A woman of many talents, Shana Alexandria Haughton is both a fire inspector in the City of Baltimore and the owner of a fashion boutique shop. Although the two positions are vastly different, Ms. Haughton is well-suited to the responsibilities of each; her ability to connect with people is valuable in both retail and emergency response situations. By day, Ms. Haughton is thriving in her job as a firefighter and paramedic, which she began in 2004. Years of hands-on experiences have made her an expert in emergency management, public safety, fire safety, and emergency preparedness. In 2011, she took on an additional role as a fire inspector in the Office of the Fire Marshal in the Baltimore City Fire Department, reflecting the city’s confidence in her extensive skill set. Ms. Haughton also uses her fire knowledge to run a Juvenile Fire Center program and the Baltimore City Fire Department Youth Safety Camp. Content with her position as a first responder, Ms. Haughton wasn’t looking for anything else until she went shopping for her own special wedding dress and couldn’t find a store that gave her the feeling she wanted. Thus, she founded Guilliettes Trousseau with the goal of creating a place that exudes warmth, love and excitement. Ms. Haughton hopes to help women create a beautiful love story; she knows firsthand that a wedding is an expression of a couple’s love for one another, and she wants to do her part to make every moment memorable. To help brides find pieces that are fashionable and affordable without being cheap, Guilliettes Trousseau sells both new and used dresses and accessories, as well as consignment and other vintage pieces. The boutique also has a special division where worn bridal dresses can be repurposed into christening gowns or special occasion dresses for children. Ms. Haughton keeps on top of changing trends by partnering with new and emerging designers, and is currently working on her own line of bridal suits and jewelry. In 2016, she launched a new romantic collection. In addition to her efforts as a firefighter and business owner, Ms. Haughton also started a foundation, Alex’s Heart, in memory of her brother, Winston Alexander Haughton II. Her brother was a heart transplant recipient who died in 2014. The purpose of the foundation is to help patients receiving organ transplants with critical medical bills. She has set up a Go Fund Me page for donations. 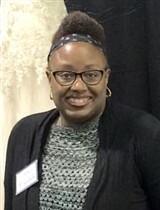 Ms. Haughton prepared for her endeavors by earning undergraduate degrees in English and elementary education from Norfolk State University and by completing coursework in organizational leadership and emergency management at Waldorf University. She also became certified in emergency services, public safety, emergency management, team building event planning, policy, preparedness, firefighting, emergency planning, rescue, disaster response, leadership development, and first response by the National Incident Management System. As a testament to her success thus far, Ms. Haughton has appeared in the Who’s Who Calendar Series, Pro-Files Magazine, Elite Women Worldwide, and Who’s Who of American Women. Looking to the future, intends to continue building momentum, growing her bridal boutique, and serving her community as a firefighter.